J. H. Ingraham. The Beautiful Cigar Girl; or, The Mysteries of Broadway. New York: M. J. Ivers & Co., n.d. 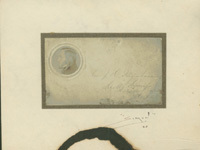 Copy of an autograph visiting card with image of Joseph Holt Ingraham. The three short stories written by Edgar Allan Poe featuring the deductive reasoning of French detective C. Auguste Dupin are considered defining moments in the development of the detective mystery genre. In “The Mystery of Marie Roget” (1842) Poe loosely based the circumstances of his fictional crime upon the real-life disappearance of a famous New York cigar vendor named Mary Rogers. Two years later, Joseph Holt Ingraham published a second and opposing fictional resolution in La Bonita Cigarera; or The Beautiful Cigar-Vender and its sequel Herman de Ruyter; or, The Mystery Unveiled. Displayed here is an undated compilation of these two volumes under the single title The Beautiful Cigar Girl; or, The Mysteries of Broadway. Ingraham, with over one hundred titles to his credit, was one of the most prolific authors of his era. Born in Maine, he moved to Natchez in 1830 (after allegedly participating in a South American revolution) and began writing well-received historical romances. Poe’s literary reviews of three of these early novels ranged from luke-warm to dismissive, and the critic included a slighting description of Ingraham in his 1841 magazine series “Autography.” Scholar Mark A. Keller has suggested that Ingraham chose to write La Bonita Cigarera, as a satirical retaliation. While Poe resolved his fictional crime with the apprehension of a murderer, Ingraham reveals the heroine to be the missing heir of aristocracy, who returns to England in secrecy so as not to embarrass her wealthy relatives. New York newspapers had touted a similar outcome in the real case, despite the appearance of an unidentifiable body pulled from the Hudson River wearing Rogers’ clothes. Furthermore, Ingraham’s tale includes a deformed character known as the “Book-man” who makes misguided efforts to locate the girl -- purportedly a caricature of Poe. Between 1843 and 1847, Ingraham produced over eighty novels – an amount that comprised almost ten percent of the total novels printed that decade. These paperbound novels, known as “story papers,” fed increasing popular demand for books and resulted from the cheap production of the steam rotary press and the inexpensive distribution offered by the growth of the railway system. Eventually Ingraham entered the Episcopal ministry and published a series of popular novels set in Biblical times. In 1860, he died in Holly Springs, Mississippi from an accidental, self-inflicted gunshot wound in the vestibule of his church. The display features a copy of a an autographed visiting card with Joseph Holt Ingraham’s photograph.